Studio Bleu, where local artists create unique and functional pottery for an inspired life. Please pardon our dust as we undergo renovations in our new location. We will re-open to the public this winter. Located on Magnolia St in the historic downtown New Smyrna Beach, we offer hands-on art experiences in an eclectic arts venue. Art events for adults and/or kids, creative team building experiences, and individual & group classes are available for art lovers, aspiring artists, or experienced potters seeking new inspiration. Practicing artists can also enjoy OPEN Studio class time in a “dirty space”. Email us for more information. Studio time and hours can be customized to meet your needs. Please contact us for additional information. We are undergoing renovations and are currently not open to the public. All Classes are by appointment and can be scheduled to meet your needs. The price includes the use of ceramic tools, 3 lbs of clay, glaze, and kiln firings. Please allow 3 weeks before picking up your work. Shipping can be arranged for an additional fee. Contact us about art events for adults and/or kids, creative team building experiences, and group fun. Studio Bleu can accommodate up to 12 people per event. 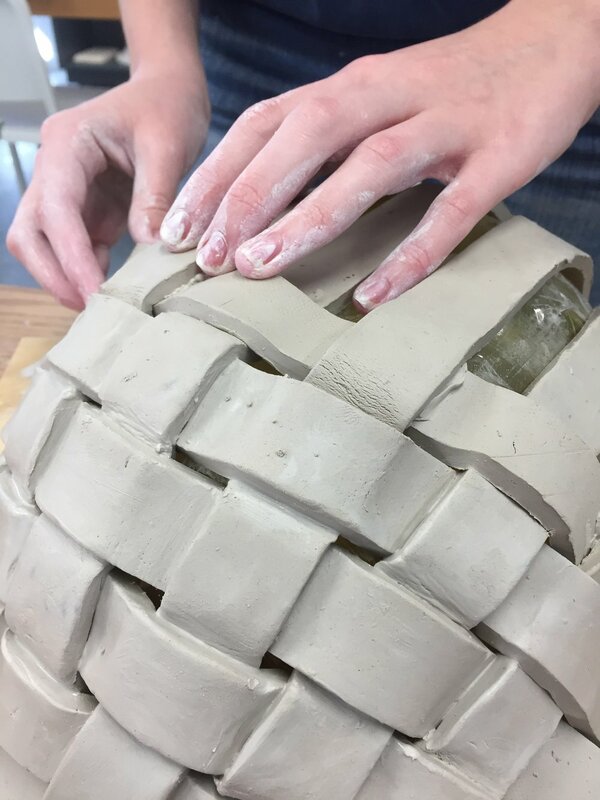 Each event will include the use ceramic tools, clay, glazes and kiln firings. You will also enjoy Mon Delice French pastries. Please arrive 20 minutes before to setup for the party. * A $50 deposit is required to save the date. Cancellations must be made a minimum of 48 hours prior to the event in order to receive a refund. ALL deposits MUST be made in-person during regular studio hours or online for a small convenience fee. Open studio is a scheduled time for knowledgeable potters and clay artists to work independently in a clean air-conditioned clay studio. An assistant will be available for questions. Check our online calendar for the latest dates and times. All memberships include the use of the main workroom and equipment, basic clay tools, cone 6 studio glazes along with a bisque, and a glaze firing per artwork. Each member will be required to attend a 15- minute introduction for studio practices. Please read each package to determine the amount of clay included. Additional clay may be purchased through the studio. Wheel time can be reserved by the hour for no additional charge.